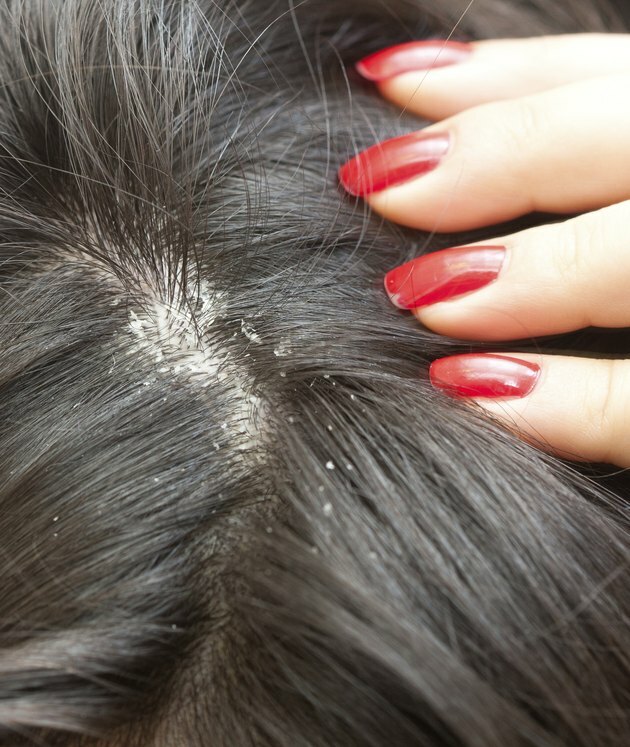 Facial flaking that resembles scalp dandruff is more common than you might think. Millions of Americans experience some degree of facial flaking. Seborrheic dermatitis is the most likely cause of this embarrassing symptom. But other skin ailments can also cause facial flaking, including contact dermatitis, psoriasis and atopic dermatitis. An accurate diagnosis is the first step in dealing with facial flaking, as treatments differ for the various causes of the common symptom. Seborrheic dermatitis is a common, chronic skin condition in adults, particularly among those aged 30 to 60. The condition is believed to be due -- at least in part -- to an inflammatory reaction to Malassezia yeast. This yeast normally flourishes in skin areas with a high concentration of oil glands. Thus, seborrheic dermatitis commonly affects the scalp, hairline, eyebrows, eyelashes, ears, the area around the nose and the beard region in men. The rash appears as flaky moist scales, often on a pink to red base. Mild to severe itchiness can accompany the rash, which is often worse in the winter months. Facial seborrheic dermatitis is often treated with topical antifungal cream, a short-term topical steroid, or both. Severe or treatment-resistant cases might be treated with topical anti-inflammatory medicines called calcineurin inhibitors, including pimecrolimus (Elidel) and tacrolimus (Protopic). Atopic dermatitis, also known as AD or hereditary eczema, is another possible cause of facial flaking. This chronic inflammatory skin disorder usually starts in childhood and sometimes persists into adulthood. People with AD have dry, sensitive skin that easily becomes inflamed. This leads to the development of intensely itchy, dry, scaly, red or pink patches of skin. Among adults with AD, the face and neck are commonly affected -- especially the eyelids, forehead and sometimes the cheeks. Additionally, people with AD often develop another condition called pityriasis alba on the face, characterized by small, pale, flaky spots. Regular use of moisturizers is a pillar of AD management. Other medications that might be recommended include a short-term topical steroid, a calcineurin inhibitor, and a topical or oral antihistamine. Contact dermatitis refers to localized skin inflammation that develops due to direct exposure to a substance that triggers irritation or, less commonly, an allergic reaction. Rashes due to contact dermatitis typically appear similar to AD with dry, red, flaky patches that are commonly accompanied by itchiness, burning or stinging. The face is a common site for contact dermatitis. It might develop due to products directly applied to the face, such as soap, moisturizer, sunscreen or cosmetics. Hair products are also common culprits, as is nail polish and other substances transferred to the face from the hands. Avoiding the substance that caused the contact dermatitis enables the skin to heal, though short-term treatment with topical medications might be recommended until the rash resolves. See your doctor if you experience facial flaking, especially if it is persistent. An accurate diagnosis is needed to determine the best treatment. While facial flaking rarely poses a significant threat to your health, this symptom often causes anxiety and embarrassment that can disrupt your daily life and social interactions. Even if you have a chronic skin condition, treatment can limit your symptoms and discomfort. Dermatology, 3rd Edition; Jean L. Bolognia, et al.